One of the first questions people ask when they see me: “Are you getting any sleep yet?” Currently, a good night’s sleep is Clark starting the night sleeping in his crib, waking up at 10:30 p.m., at 12:30 a.m., 2:30 a.m. and 4:30/5:30 a.m. to nurse and going back to bed relatively easily. He normally ends up as our co-sleeper from 5:00 a.m. either sleeping next to us or on us the rest of the morning. And yes, that is a good night sleep. Let's not talk about the sleep I got last night which was spent on the couch cuddled next to his co-sleeper putting in his pacifier every 20 minutes to stop the crying. I am always surprised how moms seem to operate on so little sleep for months at at time. To be completely honest, I struggled to create a morning routine with a newborn up all night. Unpredictable wake-up times with a toddler made it even more challenging. When morning comes around (depending on how the night went), all I want to do is savor those last few minutes in bed. My amazing husband honors my desire, so he gets up with our toddler and starts her morning when we hear the early morning “Dada all done” calling from her room. This extra time I choose to ‘sleep in’ creates a problem for me. When I hear my husband turn off the shower, it means it is time for me to get up. It is game time. I go one hundred percent into mommy mode. No time for me to look in the mirror, go to the bathroom, brush my teeth or take a shower. I remember feeling confused when I heard new moms say it was hard to fit in a shower. Now I know why. First thing I do is nurse Clark. I soon become covered with spit up (he likes to projectile everything he ate all over me). I then walk around, half dressed, reeking of regurgitated breast milk most the morning. I change diapers, feed Cooper, and try to convince her to let me get her dressed. Sometimes I get lucky, and Clark is okay to chill in his rock and play during the mornings rituals; other times, I am bouncing, holding and wearing him, too. We read books, I try to clean, and some mornings I try to work when the babysitter arrives. It is not until afternoon naps that I take a look at the house and myself and realize we are both a hot mess. All day long I struggle with the decision about how to spend my time. During Cooper’s nap, I think: should I clean the disastrous house, should I work on Be Better or should I nap? It isn’t until night time that I have a chance to take a breath and focus on myself, oh and my husband. As you can see, fitting in a morning routine is extra hard at this stage of my life, but it is also obvious why it is necessary. A hot shower or a morning jog would be wonderful ways to begin my day, giving some “me” time in a world fully focused on my kiddos right now. 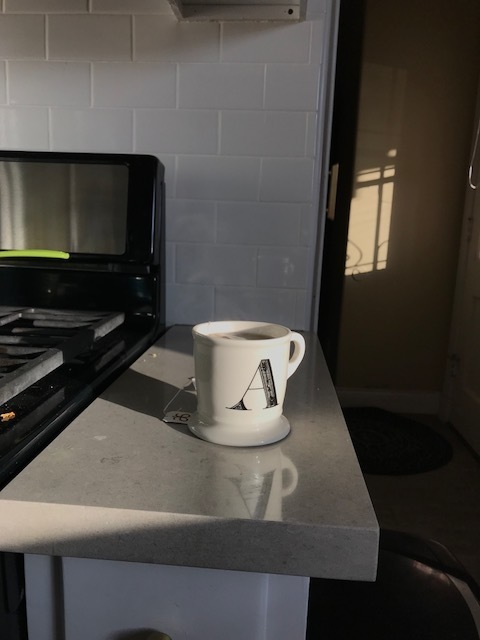 So this week, instead of focusing on my inability to create an impressive morning routine, I reflected on the little things I love about our mornings at home. First thing in the morning, I love opening up all of the blinds to let in the morning light. I love getting up and kissing my babies and husband. I ask Cooper what she dreamt about, and she has different answers ranging from “horses and auntie Mads” to “pigs.” I love turning on music, allowing it to fill the room. I love nursing in the morning because it feels extra cuddly. And even though I feel grungy by noon, I love I can do it all in my pj’s. I decided to incorporate her morning routine into mine. One morning while still in bed, before the storm of responsibility hit, I enjoyed my cuddly time with Clark before Cooper woke up. Being present and slowing down my morning, allowed me to connect with my baby boy. I sometimes fear I am not able to give him the undivided attention I gave to my firstborn, but that is a topic for another blog. So yes, I would feel much better if I were able to have a little me time in the mornings, but it might be a couple of months before I get a solid enough sleep to add showers and exercise.